There are many out of the box karaoke solutions that you can buy and simply set up at home – so why do the YouTube way? Why use YouTube for Karaoke? First, it’sFREE! The most popular good quality karaoke players (good sound, HD video, wide selection, 2 wireless mics) are too expensive. The only advantage these out of the box solutions have is they can work offline – no internet connection needed. Check from Amazon.com these popular out of the box karaoke systems: Magic Sing Karaoke System with 2 Wireless Microphones and Grand Videoke Symphony 2.0. Compare these with the price of Google Chromecast. Second, all of these out of the box solutions have one glaring limitation – the music library will get outdated eventually. You will get tired of singing the same set of songs. There will be additional fees to get the latest songs. Now, thanks to available technology, YouTube and Chromecast, you can have a karaoke party with all of the latest songs (yes, ALL! ), and enjoy your karaoke setup as long as you can (unless your equipment breaks down). Lastly, using YouTube, choosing and selecting songs is a lot more fun with the YouTube TV queueing capability. Use your smartphones (iPhone or Android) and tablets (iPad or Android) connected to the same wifi to add songs to your queue and YouTube will automatically play each song one after the other! If you have a smart tv or an apple tv, and have a way to mirror YouTube to your TV, using Chromecast is not needed. But if you have regular (non-smart) TV with HDMI, use Chromecast to connect your mobile device to your TV wirelessly. Before buying the Chromecast, I have tried to use my existing Apple TV for karaoke but sadly, it does not support the YouTube TV queuing functionality that Chromecast does. In using the Apple TV, you will need to create a playlist (which does not consistently refresh real time) while in Chromecast, the TV queueing is built in, there’s no need for a playlist, you create your song queue on the fly with friends. Once you have done karaoke with the Chromecast TV queueing, karaoke will never be the same without it. Before we begin, you’ll find example products below from Amazon.com to illustrate the different equipment you’ll need. I may get a small commission from the use of these links and your purchase helps the continuity of this site. Don’t worry, prices are the same if you purchase through these links or directly from Amazon. Audio cables as needed. Check the instructions below. 1 Microphone – I recommend having 2 UHF Wireless Handheld Microphones. It’s a lot for more fun to do duets and to move around with 2 wireless mics. UHF (Ultra High Frequency) type is preferred although more expensive but a lot more reliable. Examples are the PylePro Premier Series UHF microphones or the Fifine Dual Channel Wireless Handheld Microphone,easy-to-use handheld UHF wireless system. I’ve tested it in my sister’s setup and so far it works well. Remember to get Microphone Windscreen Foam Covers to protect your mics from singer’s spit and to add more color to your karaoke party! These covers are washable and reusable. 2 Amplifier/Receiver/Home Theater – where you connect your mic and speakers. You may already have existing equipment that can be used. This can be your home theater or DVD player. See table below. An amplifier and receiver provides power to the speakers. Some speakers have this built-in. The key thing to check is if you have existing equipment – does it have a microphone input? 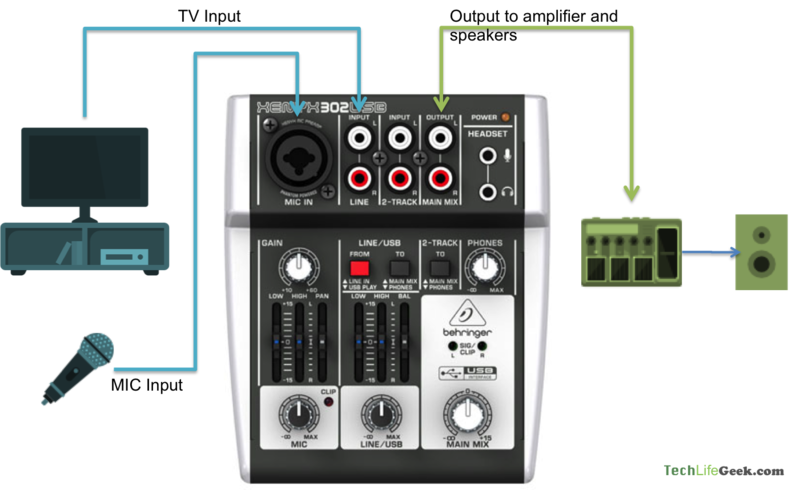 If none, then a mixer is needed so you can connect the mic to your existing equipment. 3 Speakers. I used to utilize my existing home theater speakers (Polk Audio) for karaoke but later learned that there is a high risk of damaging the speakers when using with a microphone. Home Theater speakers are not designed for live sound but are great for recorded sound. I did notice that the speakers gave feedback and sometimes had sound distortion depending on how loud the voice of the singer is. Karaoke sessions can get intense and we really can not control what the singers would do! I had to adjust the mic volume frequently to avoid damage to my speakers. I got tired of getting anxiety over damaging my speakers and bought a different set of speakers designed for mic input. There are karaoke specific speakers you can check such as the ION Audio Party Rocker Plus. This speaker has an amazing lights feature that follows the beat of the music! In using this speaker there’s no need for an amplifier or a mixer, just simply connect your wirelesss mic to the MIC input and music source to the AUX input then you’re good to go! This speaker also has the echo effect to make you feel you are in a professional karaoke bar! When checking out speakers for karaoke, remember that for Karaoke, PA (public address) speakers are more appropriate. The LyxPro SPA-8 is an example of a compact PA speaker that can be used. It has a built in amplifier and mixer. It supports many input types – bluetooth, AUX, MIC and RCA. But it does not have the echo effect included. 1 Connect all of the related hardware components – the mic to the sound system and the Chromecast to your TV. Plug the Chromecast in your HDMI port, if your TV has USB, use the included USB cable for power. TIP: You can use your mobile phone USB charger to power up your Chromecast. Option 1 – Use 2 different sets of speakers. Output the Chromecast Music to your existing Audio setup such as home theater to get quality sound. Then output the Microphone audio to a different set of speakers used for Karaoke such as PA speakers. This will avoid damage to your expensive home stereo speakers. Option 2 – Use one set of speakers for Music and Mic. This is a recommended option if you don’t have an existing home theater or speaker set in the TV setup you’re planning to use for karaoke. Depending on the speaker set you plan to use, you may need to get a mixer. If you are using the ION Audio Party Rocker Plus, no need to get a separate mixer. Just connect the microphone/s to the MIC IN jacks. Since the Chromecast outputs audio in your TV, you can choose to output your TV audio to the ION Party Rocker. Check your TV Audio Out ports and get the appropriate cable to connect your TV to the ION party rocker. Some of the options can either be a 3.5mm Male to Male Stereo Audio Cable to use the headphone jack of your TV. Or a 3.5mm to 2RCA Audio Aux Stereo Y Splitter if your TV uses an RCA Audio Out port. 2 Test that your connections are working and sound can be heard from both TV and Mic. 3 Setup your google chromecast – follow the Chromecast setup instructions. 4 See video below on how to cast videos and add to your TV queue. All your friends connected to the same WIFI network can add to your TV queue. You can all build your own list of songs together. 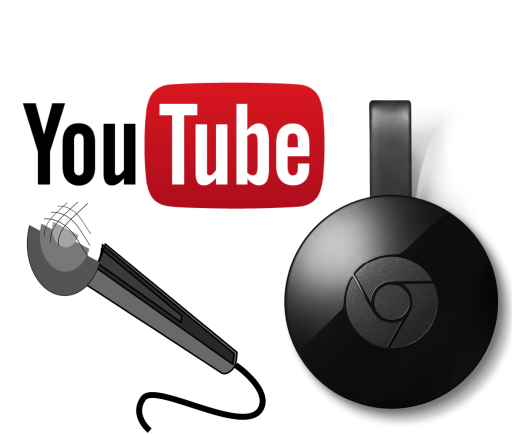 Get your free Quick Start Guide to help your guests cast videos to your Chromecast using their own devices! 5 Browse in YouTube for songs, artists – add the keyword “karaoke” after each song or artist name. Add selected songs to your queue. 6 Have a karaoke party! 7 Check our article on Karaoke Tips for Chromecast users to know how you can make your karaoke party more fun! By default, the audio from the chromecast will be heard from the TV and the sound from the mic will be heard from your sound system. If you want to combine both TV sound and mic to output to your sound system speakers then you would need to use a mixer. See below example on how you would put it all together. This sample is combining the sound from TV-chromecast and mic to output to your speakers. The BEHRINGER XENYX 302USB is universal mixer that you can use for your other audio needs. It produces a clean sound but does not have any sound effects feature. It is very compact and uses a USB connection. You can use it for recording with your computer. To get the reverb/echo effect that you typically have on karaoke bars, you would need a mixer with an echo effect. I highly recommend the ammoon Karaoke Sound Mixer. This is an affordable compact size karaoke specific mixer. It is small, you will easily be able to integrate and hide it within your existing TV/multimedia shelf. Other mixers are too big and expensive for this use. TIP: Use your TV headphone 3.5mm output jack, and use a 3.5mm to 2RCA Audio Aux Stereo Y Splitter Cable to connect it with the mixer. Connect your TV sound output to the mixer in MUSIC IN and connect MUSIC OUT to your speakers. Connect your microphone to either MIC 1 or MIC 2. Since the Chromecast is connected directly to the TV, no need to use the VIDEO IN. Use the ECHO effect to make you feel you are in a karaoke bar! *Icons designed by Freepik, Roundicons, and Madebyoliver from Flaticon. Share in the comments section, the most number of songs you and your friends can come up in your queue! Our record is 72 songs, what’s yours? Can you recommend a good, inexpensive mixer which allows pitch adjustment? Thanks. Have the following AV receiver with XLR imput for microphone maybe? Do I still need a Mixer to setup Youtube Karoake through Smart TV? Hi Ty, that’s one great receiver! However, it does not take in microphones. The XLR found on this receiver are pre-out for for connecting an amplifier. A mixer is still needed to connect a mic. Also, I would NOT recommend that you would use your high end set of speakers for microphone input to avoid damage. I would recommend getting a different set of speakers for your mic – a set of active speakers such as the Ion Party Rocker which are made for mic input. These speakers have mic input built in so you won’t need a separate mixer or amp for them. I’m sure you have an enjoyable sound system! Thanks for the advise TLG. Follow up and got a Yamaha Mg10xu mixer and mic and tested at guitar center and works ok with just the Mic hook up directly to a PA speaker. When trying to mix both YouTube and Mic with Av reciever that’s where I’m having problem. Tried sending YouTube input via optical cable to RCA converter from Smart Tv to mixer and output via 1/4” to RCA to the Av reciever I just can’t get it to work. Any guess what might be the problem? Part 2: If i return the Yamaha Mg10xu mixer in exchange for a amplifier with mic input so I can avoid using the rxa3080 what model would you suggest? Hi Ty, I looked at your Yamaha A3080 and found Audio 1 or Audio 2 to be the input you would need. The question I have is – how are you connecting YouTube to your TV? Are you using the Smart TV’s built-in YouTube app? Using this and without the mixer, are you able to successfully hear music through your receiver? My suggestion is to try to isolate where the problem is. Check if the RCA converter is working. Connect it to a headphone and see if it works before connecting it to the receiver. Then make sure you are selecting the right mode in your receiver. As indicated in my previous reply, I would recommend getting a different set of speakers for your mic – a set of active speakers such as the Ion Party Rocker which are made for mic input. These speakers have mic input built in so you won’t need a separate mixer or amp for them. Thanks again for all the assistance. I’ll be making my final decision based on the options you’ve given me. Wow! That’s wonderful, TLG! Thanks again! By the way, the UHF dual channel wireless mic system you recommended is good but only goes up to 80 feet, has echo but no reverb. I’m hoping to get one that can extend to 200 feet or so with more effects including echo, reverb, key/pitch changer. I think I’ll just get a mixer with some or all of these features. And, if and when I get a mixer, will I need to connect it to my TV, sound bar and/or the PA speaker? Thanks very much. 1. Get a PA Speaker system with built-in effects that you like like reverb. 2. Get a mixer like what you mentioned. If you plan to separate the music from the mic output, technically you don’t need a mixer. As the TV will directly connect to the soundbar and the mic to the PA speakers. But if you are looking for effects not available on any PA speakers, you will need a mixer. Thanks so much for the two suggestions and recommendation for the wireless microphone and the PA speaker. But, I’ll definitely stick with first one–to have separate speakers for music and microphone. The second option requires too many connections. But, just to quickly confirm: with the first suggestion, I don’t need to connect anything between my TV and the microphone system and/or the PA system? Correct. You do not need anything between TV and microphone. As the TV will use existing speakers whole your microphone will use a different set of speakers. Have fun! I’m so glad that I found your very informative and helpful article. It’s just coincidental that I’ve been searching for this type of setup for quite a while now. I’ve got a Samsung (UN55MU8000) UHD Smart TV with the One Connect Box (https://www.samsung.com/us/support/owners/product/2017-uhd-smart-tv-mu8000?redir=un55mu8000), a Yamaha YAS-107 sound bar (*discontinued)(https://usa.yamaha.com/products/audio_visual/sound_bar/yas-107/index.html) and of course, Chromecast using the Youtube app from my iPhone casting to my TV. The audio from the TV is paired to the sound bar. In terms of mixers, I see that now there is an all-in-one portable PA system that includes a mixer and a PA speaker with advanced functions. Would you recommend it? Will I need a toslink cable to connect to a digital-to-analog converter and then to the mixer? Is the digital-to-analog converter the same as an AV-to-HDMI converter? Will I need a receiver or is it already included in the microphone system bundle? Please clarify and let me know if there’s anything else I need to do or have missed? I really appreciate your time, professional advice and guidance. Thank you. If you are like me where I prefer to use separate speakers for music and mic, then you can just purchase a wireless microphone set with built in mixer and an active speaker such as the Ion Party rocker. This way you can use your existing setup with chromecast and TV and sound bar while having the mic and PA system. I prefer this as the sound bar and most home theater speakers are not designed for microphone input. However if you prefer to use the same set of speakers then what you are assuming is right. You will need a mixer and the toslink converter. Use the TV output and toslink converter to connect to the mixer and connect the mixer to the soundbar. The microphones will also connect to the mixer. Hi. Thanks for the very helpful info! I have set up a system, which is working fine, but was wondering if there is a simple way to get pitch adjustment (preferably without having to get a file, adjusting the pitch using an app, and then saving the adjusted file). Thanks. Hi DL, I am glad you found this article useful. I haven’t tried any pitch adjustment methods yet other than what is available on the mixer so apologies if I am not able to help you on this. Hi Veno, find a way to connect both your projector source and microphone to the mixer. And then the mixer outputs to the Onkyo AV system. This way both the music from your projector source and mic goes to your speakers. Note though that I do NOT recommend using your Bose speakers with a microphone, you might damage them. Please read this article for more info. How to setup Karaoke at Home using YouTube. 7. Most of cable to connect. Please help to connect them for a great sound karaoke system and if you have some advice, please tell me. I am very new on this but I am serious to have a karaoke system by myself. I appreciate for your instructions. Hi Khai Le, sure let me help you. Please first check if this other article provides clarity on how it can be done. How to setup Karaoke at Home. The cables you need to connect are already included in your microphone set. Apple TV will no longer be needed. Let me know if this article helps. I got you now but some confusion still need your help here. 1. On mixer Xenyx 802: what ports to connect to my speaker to get a good sound quality (I am using Line in 3/4 and put a 6.5mm jack into L port) and I have to connect into L & R or just one of them (I have all cable to use on all solutions). 2. On mixer Xenyx 802: I am using Main out L to output sound to 6.5mm jack on my speaker, and use 6.5mm port Line in for my Fifine microphone. Am I using the right port to get a good sound or any recommend on this? 3. On speaker Behringer B210D (amp built in): it has a 6.5mm, a xlr output, and a xlr output. What input port should I connect to my mixer. Hi Khai Le, using the Xenyx 802 or any mixer, always use both L (left) and R (right) to get a balanced sound. Same with using the Main, use both L and R, not just one. On your B210D speaker use the first input – 1/4″ inch jack. It seems like you are using only 1 – L which will have a mono sound effect on your karaoke, use both L and R for a stereo sound, which is better. Hope this helps. Hi Mike, how did you connect the mixer to the speaker? If it is through the same receiver, the receiver will typically output only from one input. I suggest connecting the TV to the mixer also and then output the mixer to the receiver. Hi, you may try checking these out – ION Party Rocker and LyxPro SPA 8. My setup includes a separate home theater speakers for the music, and an active speaker – the ION Party Rocker for the mic audio. This way I am certain that I don’t damage my home theater speakers when using with a microphone. Hope this helps. I would love to do a YouTube video of this in the future. For now, hopefully this other article you’ll find useful – How to setup karaoke at home using YouTube. There are a lot of useful comments in this article too that you may find helpful. I bought a mixer today and it works fine with iPad. But not working with smart TV (I connected from smart tv audio using rca cable to line in mixer, from out mixer to amplifier then to speaker. So, I assumed the mixer doesn’t have the capability with smart tv? Or what is wrong? Hi Nicole, I think the mixer is fine, the TV might need to have its sound settings adjusted. Please let me know exact make and model of your TV so I can check it out. Thanks! It’s Samsung smart TV model PN60F5500AF. As soon as I plug audio rca able from tv to mixer then will shut down the sound from speakers and music sound from YouTube TV. Thanks, this helps. This Samsung TV Model does not have any Analog Audio out that you will typically use to output audio out to your mixer. What is included are Audio RCA INPUTs. 1. Use the Digital optical audio out of the TV using a Toslink optical audio cable. 2. Connect the other end of the Toslink cable to a Digital to Analog converter box. 3. Connect from the RCA audio out of the Digital to Analog converter box to the RCA input of your mixer. Do you know Toslink cable to a Digital to Analog converter box (the box has more than 2 RCA output) because I want to use for external speaker and a mixer without switchingback and forth? Thanks very much and I finally had a chance to look closer to my TV model. I got it and thanks very much. I’m also looking for 1 optical convert to multi RCA? Do you know what is good model to use? Hello, I don’t think there is anything like that available. Let me know what is the outcome you are trying to achieve so I can think about how I can help. P.s: I had not tried the audio input yet but will do when I have time. ->>>1 more question: My same TV has the vertical color lines appeared on the screen. I opened back and tried to clean up all the cables but still cannot resolved. Any ideas what caused the vertical lines? Need New t-board/motherboard replaced? Glad that it worked well for you! Happy holidays! Thanks again, i’m waiting for my analog convert box coming tomorrow then will let you know. 1. Also, my audio input (TV) using RCA cable (how does it work?) can I connect my audio output from other Older model karaoke to the TV audio input ? Do I need to set up anything from tv to get it work or just turn the volume higher? While turn on the TV may interfere sound with The karaoke sound. Would u please explain that? 2. My other DVD player model :Apex AD-800 is messed up the resolution when connected to video cable from TV. I cannot get pictures any more. The TV said it needs to re-adjust the DVD player resolution to be compatible. Now, I cannot see the picture any more and no way I can re-set while blind. I would like re-set the DVD player back to default manufacture but cannot do it neither. Would you please help? Yes, you can connect a karaoke machine to your TV using the RCA cables. You just need to adjust the settings of your TV to select the source – typically indicated as AUX or Video In. It depends on your TV model and its menu settings. The Karaoke sound from the machine source, will then use the TV speakers once you connect it to your TV’s RCA cables – video (yellow), audio (white and red). The DVD model you are using is quite old, I am not familiar with it but it seems it is no longer compatible with your TV. I used the same TV model Samsung smart 65” gave you above but could not find the setting from my remote control. Would you please guide me specific from the remote control? Hello, please press the source button on your remote control until you select the correct source input. The vertical line has appeared recently. If it’s easy to fix then I can replace the t-board/motherboard, else a new TV might be an idea. —>See this article: I had the same issue—>>>recommended: cleaned a all the ribbon cables but still couldn’t resolved. I have a similar setup using a mixer and a receiver. However, my TV doesn’t have stereo or RCA audio outputs. 5) Mixer to receiver, receiver to speakers. My issue is that the Optical->DAC causes the music from my TV/Chromecast to sound distorted, The music has a lot of echo and doesn’t sound right. Is there any other solution to get the audio from the chromecast onto the mixer w/o using the DAC? I’ve also tried a more expensive DAC that has an amplifier built in (it’s a headphone DAC)…but the sound issues are still there. 1. Existing Chromecast to TV connection. 2. Connect TV optical out to Receiver. This will output your music to your receiver and to your good speakers for music. 3. Connect mic directly to karaoke speakers. This is the setup I currently use and could not be happier. Hope this helps. Hi, my question is if I have a smart TV so how could I connect with the amplifier and speakers? Do I need to have a chrome cast? If your TV can connect to your WIFI and has a YouTube app, you don’t need a chromecast. You can refer to this article – How to Connect YouTube from your Mobile Device to your TV. Please also read this article on how you can use a mixer to setup karaoke at home. Just connect your TV to a mixer, connect the mic to the mixer and output the mixer to the amplifier. Goodluck! Thanks for this amazing instruction set. Just one question, since it isn’t advisable to connect ones mics to output through a home theatre amp speakers (I have an Onkyo receiver and Wharfdale Diamond 8.4 Speakers), does having a mixer inbetween help negate the detrimental effect that the mics have on the speakers? I was thinking Fifine or Behringer. Hi Russell. Glad you found this article useful. To answer your question – Yes and No. Yes – It helps to an extent because the mixer will allow you to make more adjustments to control the output of the mic to your speakers. And NO – you will NOT have total control of all the factors that can damage your speakers. One big factor is the singer. Believe me, there are singers who would just let it all out or their pitch is just too high their voice too loud that at some point it will cause your speakers to distort. I’ve learned this the hard way – I first used my home theater setup (Onkyo receiver + Polk Audio speakers) and I had to frequently adjust the volumes depending on the singer to avoid damaging my speakers. Which is why I’ve decided to get a different set of speakers for karaoke such as the Ion Party Rocker. I no longer have to deal with anxiety over the volume knob! To learn more about setting up your karaoke system at home, please also check this article – How to setup karaoke at home using YouTube. Hope the setup works well for you and enjoy! Hello..can I connect to my mixer console? Hello..can this ffine karaoke mixer connect to my mixer console? Hi Harry, yes the Fifine karaoke mixer should be able to connect to another mixer, using a 3.5mm input or an RCA audio cable. Is there any reason why you would want to do this? So before I rush out to buy items, can you clarify something for me? I currently have chromecast connected to an HDMI port. I also have a pioneer receiver which channels all my components like PS3 etc to the tv via HDMI. If I DON’T want to use my home theater speakers for music how do i set it up? If I get the Fifine dual wireless mic system, I won’t need a mixer from what i understand. I can chromecast my phone or ipad to get youtube karaoke onto the tv even without youtube app to queue ahead. My Fifine mic system will plug into a speaker like the ion party rocker plus using the mic port. At this point, youtube will be on the tv, the mics will be broadcasted through the ion speaker. How do I get the music to go through the ion speak as well? do I plug my ipad/phone into the r+l input jack at the back of the fifine? Hi Han, If for some reason you DON’T want to use your home theater speakers for music, then you need to find a way to output the TV music out to the karaoke speakers. One way is to use the headphone jack of your TV if it has one and using the 3.5mm to 3.5mm wire included in the Fifine dual wireless mic, connect your TV to the Fifine mixer – from the TV’s headphone jack to the mixer’s R+L in jack found on its back. Then using another 3.5mm to 3.5mm cable, connect the Fifine wireless mic’s mixer using the R + L OUT to the ION speaker‘s AUX input jack found in front. Remember that the chromecast plugs directly into your TV and it will use your TV’s audio for its music, using my advice above, you would be able to output the music out to your ION speaker. In case you change your mind, using your home theater’s speaker system is totally fine for music, just avoid using it for mic output. My setup at home uses my home theater’s speakers for music for quality sound while I use another speaker for the wireless mics. Hope this helps. Wanted to thank you. I finally found time and pulled the trigger. Got fifine wireless mics with mixer, vocopro thunder 1500 and rca output from tv to vocopro. Works great and others have been asking so I’m helping them set up now. Appreciate your help and posts! Hi my question is can I connect my fifine dual mic to a pa speaker for mic sound and use my home theatre for music only. Hi Joey, Yes absolutely. This is how my current setup is done. Mic connected to a PA speaker and music from my TV is connected to my receiver which is connected to my home theater speakers. This way I get great quality sound for my music and at that same time a good volume for my mics. With the ion audio party rocker, we eliminate the need for stand alone amplifier and mixer. We just connect the microphones to the MIC IN jacks. What if I have wireless microphones? Hi David, standard wireless microphones come with a receiver which then you connect the receiver to the ion party rocker. An example wireless mic is the Fifine Dual Channel Wireless Handheld Mic. 1. Do not change the connection of the android box to the TV via HDMI. 2. Use an audio cable to connect your TV to the mixer using the TV’s headphone jack. Typically a TV’s headphone jack uses a 3.5mm AUX output. Here’s an example of an audio cable that can be used to connect it to the mixer. 3.5mm to RCA cable. 2. Connect your mixer to the soundbar’s AUX IN. 3. Connect your mic to the mixer. This would output both your TV’s audio and mic to the soundbar. Hi there. Can I use an Computer audio interface like Focusrite Scarlett’s 2i2 instead of a mixer, (remaining setup being same as above like Chromecast, TV, Home Theatre, and wireless Min’s? Please advise. Hi Anil, if you are referring to this Focusrite Scarlett’s 2i2 and you have it already, you can try using it by turning on the direct monitor function to ON. This way the sound is transferred to your speakers. Since this audio interface is specifically designed for recording and I have not used it, I am not sure if there is a function to turn off recording on its software and just use the Direct Monitor setting to ON so you can transfer your MIC output to your speakers and use it as a mixer. I hope that helps and hope it works! https://www.amazon.com/gp/aw/d/B01N6448Q4/ref=ox_sc_act_image_1?smid=A2AN59XOQCTDYD&psc=1 and hook it up to my sound bar? I dont mind adjusting the volume to the mics when needed. Hi Nikki, I checked your speakers and I think you are right. You can get the Fifine microphone and use its included mixer. I haven’t tried this and not sure of the quality of its sound. But this would be the most least expensive option for you. Instead of directly connecting your TV to the soundbar, connect the TV instead to the mixer (R+L IN) and then connect the mixer using the R+L OUT jack to your soundbar. You can then adjust the TV sound vs MIC using the Music volume knob and the MIC Volume knobs on the mixer. If this does not work or the quality is not good, then get the Fifine mixer as well. I’m really hoping just the Fifine mic will work for you, it’s a good value for money. Hope you let us know! Hi Kaw, your RCA connection from your TV to the fifine mixer, does the TV have RCA OUT? I don’t have a TV with RCA OUT, I typically see TVs with RCA IN. The only way I’ve seen that is successful to use the TV as input sound source is to use its mini jack – 3mm AUX OUT from the TV to the mixer. I hope this helps. Why do I need Chromecast if I can access internet/Youtube thru the Smart Tv already?